The research explores the effect of industrialization on human capital formation. 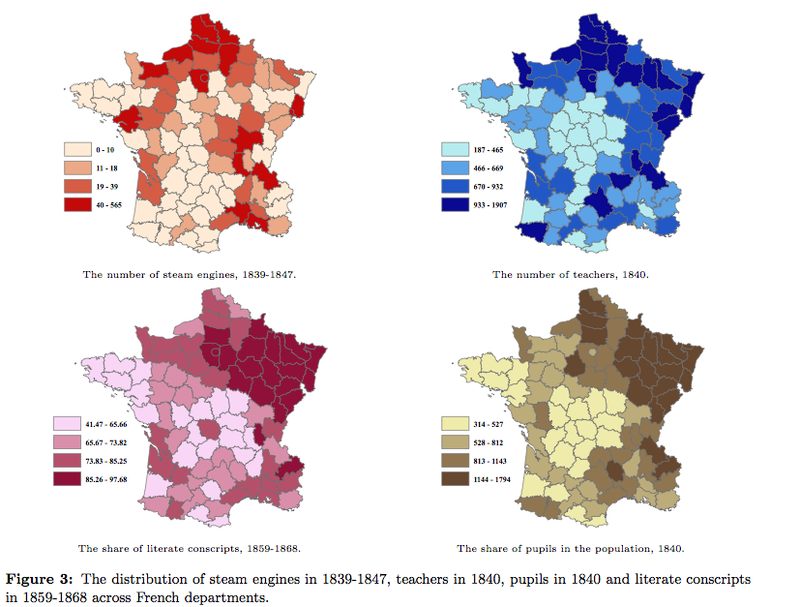 Exploiting exogenous regional variations in the adoption of steam engines across France, the study establishes that in contrast to conventional wisdom that views early industrialization as a predominantly deskilling process, the industrial revolution was conducive for human capital formation, generating broad increases in literacy rates and education attainment. While human capital is often thought to be at the root of any development process, early industrialization itself is often thought to be de-skilling. Images of children working long hours executing repetitive tasks usually come up when one thinks of the Industrial Revolution (Humphries, 2010). Yet there is also the idea that industrial and technical development might lead to a greater need for skilled labour to maintain, fix and adapt new machinery. In this case industrial development might lead to a greater supply of schooling and might result in significant human capital improvements. Focusing on early French industrialization in a recent working paper (distributed by NEP-HIS on 2015-05-02), Franck and Galor attempt to demonstrate just this. Making use of data from the 1840s, the authors find a positive correlation across French departements between the number of steam engines and human capital indicators such as the share of literate conscripts, the share of pupils in the population, and the number of teachers (which would be more suggestive if also set relative to population). This correlation is best illustrated in a series of shaded maps (Figure 3), although the strikingly high levels schooling and literacy in the north-eastern part of France remain to be explained. Of course, correlation does not necessarily imply causation: it may be that other factors caused both the number of steam engines and the number of teachers to increase in certain areas, which could render any relationship between the two fortuitous. Figure 3 in Franck and Oded Galor (2015). To tackle this endogeneity problem, the authors make clever use of the fact that the first steam engine was introduced in 1735 in Fresnes-sur-Escaut in the Nord departement, near the northern tip of France. Since technology diffusion can be reasonably assumed to occur first around the region where the new technology was first introduced (which was indeed the case), it seems possible to use each departement’s distance from Fresnes-sur-Escaut as an instrument in the regression. In the first stage of the regression, they successfully show that the shorter a departement’s distance from the first steam engine location, the larger the number of steam engines in the departement, which seems quite reasonable. To prove the exogeneity of the instrument, the authors have to show that human capital formation was not higher closer to the first steam engine location. This is trickier. To support their case, Franck and Galor investigate the relationship between distance from Nord and economic development indicators from around 1700, such as urban population, literacy rates and university location. They find that there is no correlation (although this may be surprising in light of Figure 1). More importantly, human capital may be quite imperfectly captured by these indicators in the pre-industrial era, when human capital may have developed in ways that are quite difficult to measure: through the transmission of skills from masters to apprentices, or learning-by-doing. It has often been shown that there was no clear relationship between technological progress and literacy rates in the early modern era (Mitch, 1999). Accordingly perhaps more detail should be provided in the paper as to why the steam engine was first introduced in this region and not elsewhere. Which brings me to a broader point about the paper. Although its stated aim is to investigate the causal relationship running from technological progress to human capital formation, causality could run the other way around. Although endogeneity issues are explicitly addressed in the paper from (and confounding factors such as land suitability, rainfall, access to waterways, distance from Paris, and market integration duly controlled for), the specific problem of reverse causality is not explicitly dealt with in the text. Reassuringly the IV model should theoretically take care of reverse causality, but the authors could still discuss this possibility in more detail. Boys at school in Nord departement in the 19th c.
Overall though, Franck and Galor rather successfully tackle a very important and highly complex aspect of industrialization processes. By showing that technological improvement led to advances in human capital accumulation, these results in turn trigger a number of questions. Through which mechanism did industrialization lead to better schooling and literacy rates? Was the process demand-driven? Or did parents’ higher wages mean that children no longer had to work to help the family? Finally, could child labour abuse in factories have led to local initiatives to promote schooling? This latter hypothesis is discussed by Weissbach (1989), who emphasizes a particularly strong will to change the status quo in Alsatian and nearby regions — which could partly explain the greater spread of schooling in this part of France. Such inquiries could be the subject of fascinating future research. Humphries, Jane. 2010. Childhood and Child Labour in the British Industrial Revolution. Cambridge: Cambridge University Press. Mitch, David. 1999. “The Role of Education and Skill in the British Industrial Revolution.” In Joel Mokyr, ed., The British Industrial Revolution: An Economic Perspective, 2 ed. Boulder, nd CO: Westview Press, pp. 241–79. Weissbach, L. S. 1989. Child Labor Reform in Nineteenth Century France: Assuring the Future Harvest. Louisiana State University Press. This entry was posted in Economic Geography, Economic growth, Economic History, Industrial Revolution, Inequality, Social capital and tagged economic history, inequality, long-run economic growth, Steam engine on 2015-05-19 by harrymclary.